Hey guys so after a year of fighting dino's and eventually being on the losing end of it i had to break down my 40B and save w/e coral i could. Here is a pic early on of the tank. 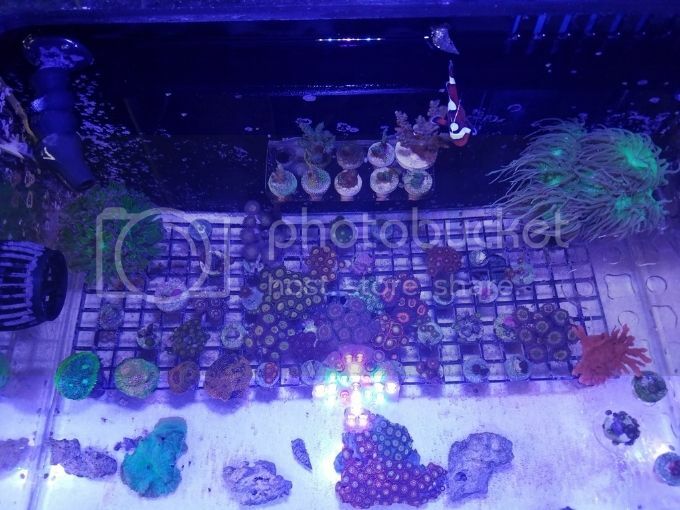 I lost all my SPS but was able to salvage zoa's, acans and few lps. All of which is doing great in a frag tank i have set up in my kitchen (wife is not to happy about this). Since the space i have is limited and i like the foot print of the 40B i decided to go with the DB 57 Rimless Edge. 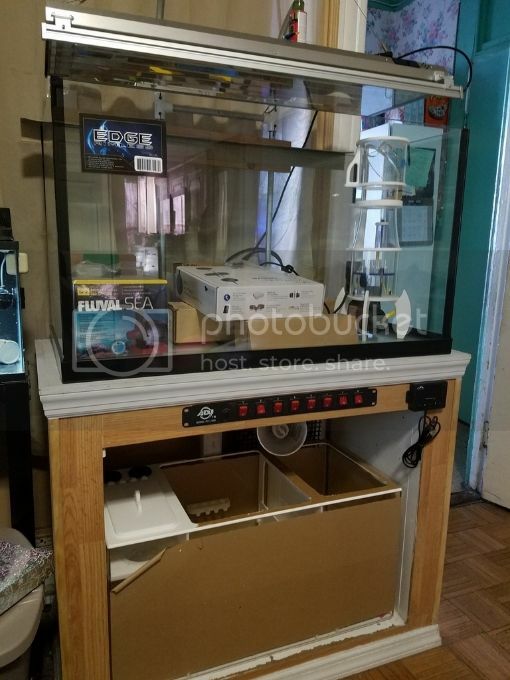 So for the last few months i have been buying and selling equipment to get everything i wanted to set up the new tank (taking my time this time around). Im finally at the point where everything has been ready for weeks now just need the time to put it all together. 4. Every thing in the frag tank eventually and more! 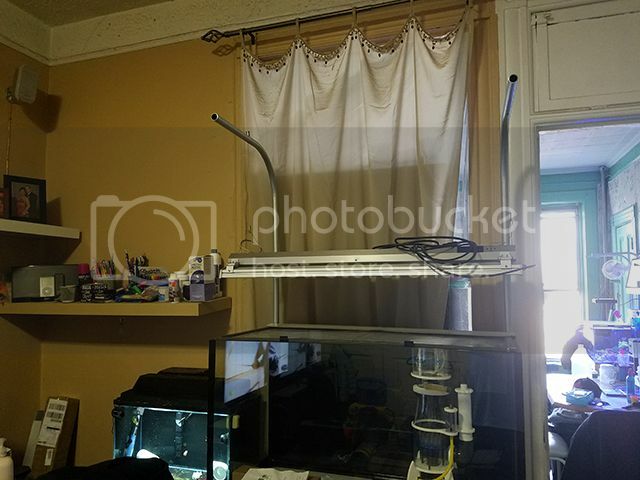 I don't have much to show right now everything is basically in boxes or sitting in the tank in my living room. I will up date with pic and more info as i progress further along in the build. 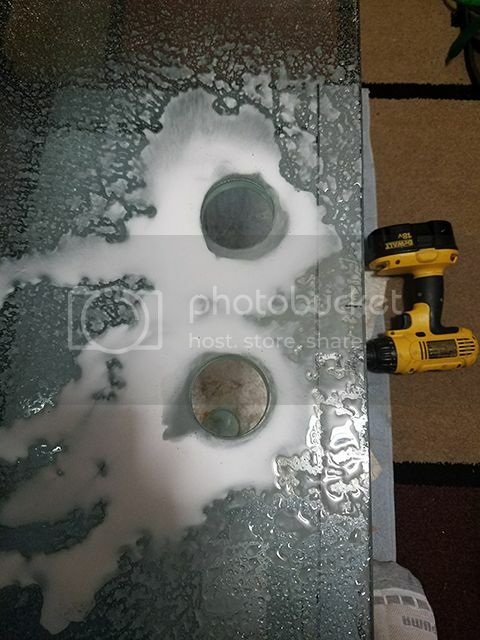 First step is to get this tank drilled, don't think my landlord is gonna be happy about me drilling a 1/2" tank in the apartment but oh well. Last edited by Odysi; 03-09-2017 at 05:32 PM..
Nice, looks like its going to be a pretty nice build. I like the switch board in the front of the tank. I wish I had thought about this before setting up my tank, but at this point I dont want to start sawing into a stand with >1000lbs sitting on it . Thx Reefiness! 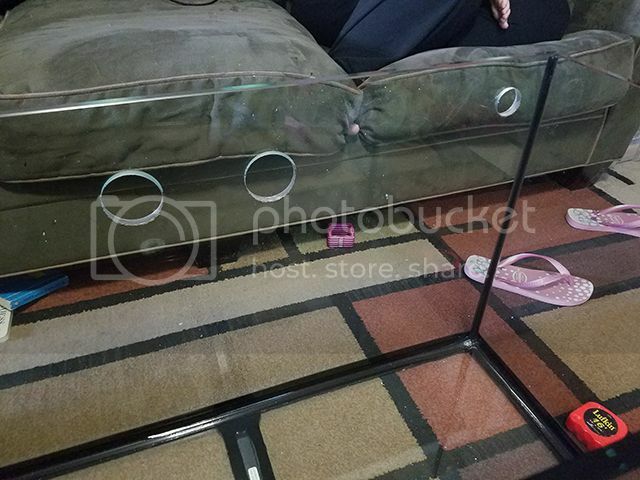 Actually its not cut into the support of the stand. Its under the 2x3 and I just closed it in with the finish on the outside and put a shelf under to hide the wires. On a side note this was a great idea until i realize my 2yr old liked it too so its turned into a me chasing him away from the tank because he likes to play with the switches. Last edited by Odysi; 03-17-2017 at 01:12 PM..
Got some free time today was able to drill the tank!!!! Final product got the over flow installed and return loc-line (might shorten the loc-line a bit). Since im doing this all in my apartment and cant spray paint i tried out some black vinyl wrap for the back of the tank. Next step i need to make some changes to the conduit i used to hang the light. 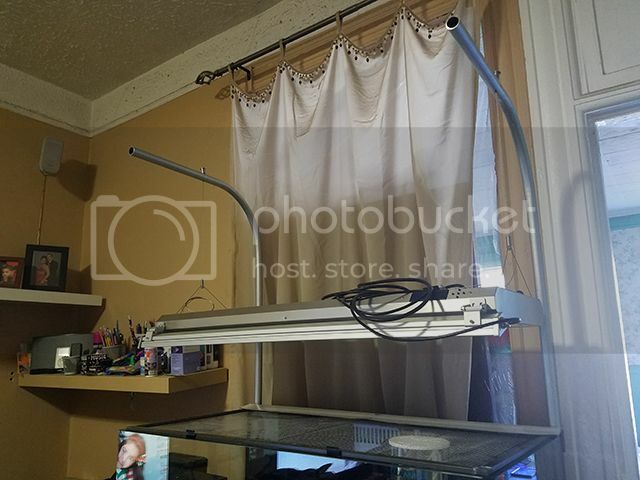 I have 1/2" conduit that i had bent to hang my ReefBreeders Photon 24 and it worked great but when i switched to the ATI fixture i really doesnt support the weight well. 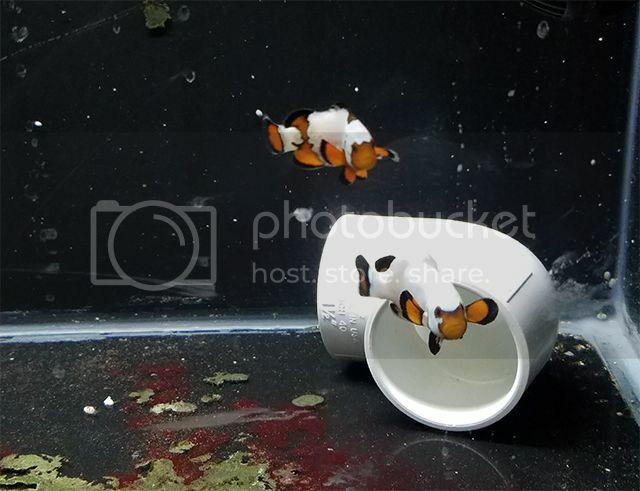 Oh here is my clown duo that will be going into the new tank. Wyoming White and Frostbite clowns! Not sure about the Frostbite but thats what it was sold to me as. Last edited by Odysi; 03-19-2017 at 07:47 PM.. Replaced the 1/2" conduit i had for the leds to 3/4" to support the wieght of the ATI fixture and it worked great no bending of the conduit at all just need to paint them black!! 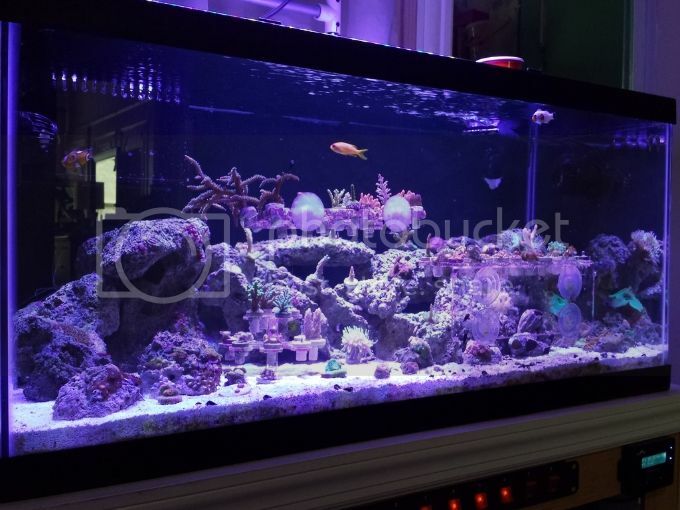 Same tank i have currently. good luck! Been a while since i last updated. Things have been busy with the holidays etc etc. The tank is up and running been cycled for 2 months now. 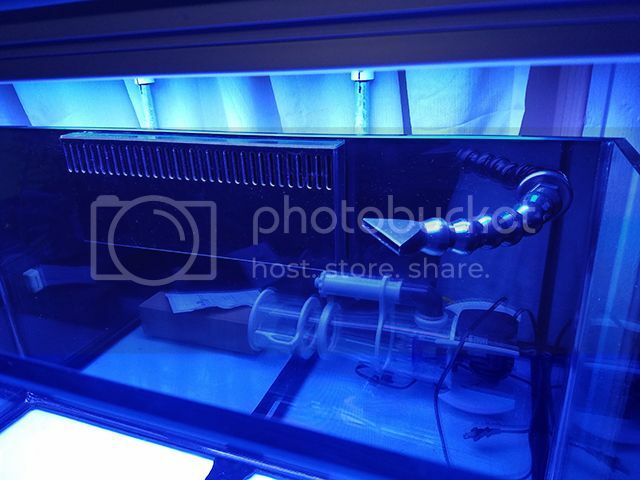 Cycle took longer then planned i over dosed the ammonia for fishless cycle and ended up with a nitrate well over 150 ppm. Needless to say few weeks and some large water changes and alot of wasted salt and the tank was good to go.